The material your garage door panels are made of will determine how much curb appeal your home will have, as well as how much maintenance you'll need to perform. It will also affect the security aspect of your home, as some materials will be stronger than other ones. If you need to get a new garage door, we can help you understand the benefits and requierments of each of the three most common materials. Before you make your choice as to which material you will pick, it would be wise to think about the kind of look you want your home to have. Do you want a classicly beautiful look? If so, then a wooden garage door may be a perfect fit for you. Wood was the first material to be used in making doors. Choosing it would truly give your house that elegant and classic look it deserves. The only problem with a wooden door is that it can be susceptible to rot and warping, and will need to be cleaned and repainted annually in order to prevent these issues from developing. A good alternative would be a door made from composite wood. Panels of this type will offer better resistance to rotting and even splitting in comparison to solid wood. They are made up of recycled wood fibers so their texture, look, and feel are going to be similar to those of regular wooden door panels. 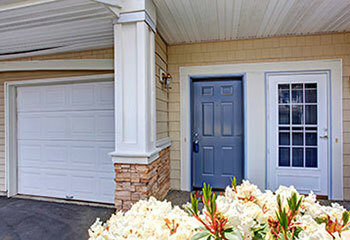 If you are looking for a more streamlined look, then a steel garage door is what you need to get. Steel doors are among the most sought-after types, as this material is far sturdier and requires lesser maintenance than its wooden counterpart. The problem with steel is that isn't naturally insulating and is usually considerably heavier than other materials. The heavier the panels are, the more powerful your opener will need to be. If you get an insulated steel door, the additional weight of the insulation material will only add to the already heavy starting weight of your door. Steel can also rust, which will ruin its look as well as its durability. Your best option to achieve that modern look of your home is a door with aluminum panels. This is a lighter material than steel, which means that even if you have it insulated the added weight won't necessarily require that you get a more powerful opener. Another main benefit that aluminum offers is the fact that it does not rust. It does, however, dent rather easily, and won't be able to provide you with the strength that steel, or even wood, could. Our experts at Garage Door Repair Oceanside can help you weigh all your options and make sure that you get the best door for your home.